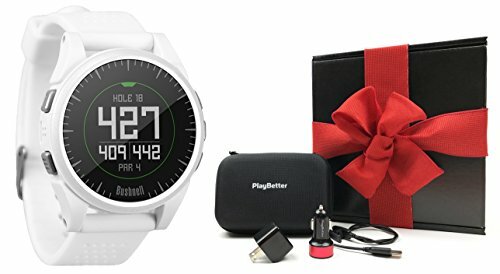 GIFT BOX INCLUDES: Bushnell Excel (White) Golf GPS Watch - 2017 Version, PlayBetter USB Wall & Car Charging Adapters, PlayBetter Protective Hard GPS Case, Watch Cleaning Brush, USB Cable | Packaged in Black Gift Box with Red Bow & Crinkle Paper! A MEMORABLE GIFT - the PlayBetter Hard Case will keep the Excel watch looking brand new while the PlayBetter Car & Wall Chargers ensure it's always with a charge! All packed in a beautiful PlayBetter Gift Box with a Red Bow and Crinkle Paper! Introductory Special! MINI PRO 3G Real Time Gps Tracker With Driver Behavior Reporting.